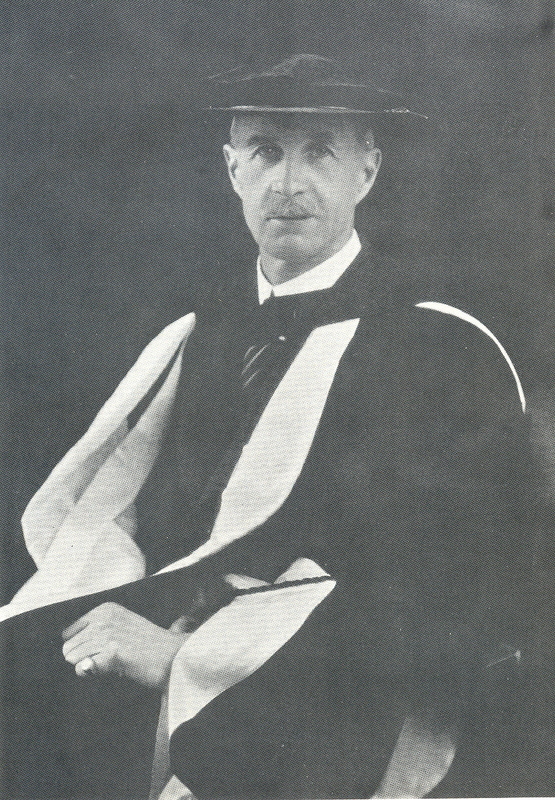 Dr. CHARLES SANDERSON FOSBERY, FRCO.,OBE.,MA.,LLD. Charles Sanderson Fosbery, was a tall man. At six feet two with large feet and a spring in his step he loped along by leaps and bounds and has been described as both terrific and somewhat terrifying. Most afternoons he could often be seen in running shorts around the Lower Canada College playing fields, or on his bicycle exhorting boys to behave themselves in his loud voice. For nearly three decades he cycled every Sunday from Notre Dame de Grace on Royal Avenue to the Church of St. John the Evangelist at the corner of Ontario and St. Urbain, where he was both organist and choirmaster. On this journey, over the years, he clocked up some 20,000 miles. In founding his school in 1909, he imprinted his own clear standards of manliness, honesty, responsibility and unselfishness. Truth was not to be evaded, no matter how the rest of the world may prevaricate, dissemble or compromise. For generations of boys at the school Dr. Fosbery was the admired and emulated image during many formative years. He came from England in 1900 to Montreal to become organist and choirmaster at St. John's and headmaster of the Private Boy's School attached to the Church. Under his influence the school prospered, but eventually he decided upon establishing his own school at the western side of the city, whilst remaining in his post at the Church. At Lower Canada College, he was known as 'The Boss'. This appellation fitted him and his style of running things completely. As head he insisted that manners and morals were inseparable and mandatory attributes. Intolerant of behaviour which fell short of his requirements he was convinced that in pulling up his socks a boy would also be hitching up his character to higher levels, but woe betide boys who were given to constantly hitching up their pants. He promoted braces over belts in this respect and abhorred 'gum chewing', and bread was to be broken, not torn with the teeth.. His definition of bad language was strict and personal. It was not allowed even in the exuberance of the sidelines at school football matches. Religion was the basis of Dr. Fosbery's educational philosophy and he would give Scripture lessons, it is said to boys as they sat on the locker-room floor. Intermixed with his own brand of pertinent and personal instruction.... " So Moses said unto Pharaoh, 'Stand up Jones and behave yourself ' ! " Tireless in his own administration, Dr. Fosbery was for many years his own book-keeper, secretary, accountant and banker. He taught several of the courses and on weekends stoked the fire. His own way of life was Spartan, his room being furnished with nothing more than a cot, a dresser a chair and a table, while the solitary electric light bulb was bare. He used his family's motto as that for the school "Non Nobis Solum" embodying it completely - "Not for Ourselves Alone". Upon his retirement he made a gift of the school to The Old Boys, who as a corporation have carried it into the future. He returned to England and married Miss Gertrude Cooke, a former matron of the school. In 1947 they revisited the school at the behest of the Old Boys where they were well received and Dr. Fosbery was heard to remark, in his typically English fashion, that he was having an absolutely 'Tip-top time'. (from an original Article by E.A. Collard in the Montreal Gazette). MUCH REVERED AND WELL LOVED EVENTUAL OWNER AND HEAD MASTER OF LOWER CANADA COLLEGE, A SECONDARY SCHOOL IN MONTREAL, QUEBEC CANADA. HE WAS THE ELDEST SON OF REVEREND GEORGE WILLIAM FOSBERY AND HIS WIFE FRANCES SIMPSON SANDERSON. THE FAMILY CONSISTED OF 6 BOYS AND 4 GIRLS, IN ALL 10 OF THEM. REV. FOSBERY WAS THE RECTOR OF COLLINGHAM NOTTINGHAMSHIRE. DR. FOSBERY WAS EDUCATED AT THE GRAMMAR SCHOOL AT NEWARK ON TRENT. HE OBTAINED HIS BA FROM TRINITY COLLEGE DUBLIN IN CLASSICS. HE TAUGHT AT CHELTENHAM COLLEGE IN GLOUCESTERSHIRE. LATER HE BECAME HEAD MASTER OF THE HOWDEN GRAMMAR SCHOOL IN YORKSHIRE, A POST HE HELD UNTIL HE BECAME THE CHOIRMASTER OF THE DEANERY OF YORK. HE CAME TO MONTREAL IN OCTOBER 1900 AS HEAD MASTER. AT ONE TIME HIS BROTHER CYRIL VINCENT FOSBERY (b.1878) TAUGHT AT THE SCHOOL. IN THE NOTES THAT I PERUSED THERE WAS A REFERENCE TO HIS SURVIVING SISTER (ELIZABETH) Miss BESSIE FOSBERY, BEING INTERVIEWED AT THE AGE OF 89 yrs. DR. FOSBERY MARRIED GERTRUDE COOKE - SEPTEMBER 10th 1935 - AND THERE WAS NO ISSUE. IN 1920's HE ANNOUNCED THAT ON HIS DEATH THE SCHOOL WOULD BE GIVEN TO THE OLD BOYS WITH CERTAIN PROTECTION FOR MEMBERS OF HIS FAMILY. HE RETIRED IN 1934 AND RETURNED TO ENGLAND TO LIVE AT BOURNEMOUTH. THE FUNERAL WAS FROM ST. SWITHIN'S CHURCH MARCH 18th 1958. THESE NOTES WERE PROVIDED IN PART BY ALEXANDER HUTCHISON, AN OLD BOY OF L.C.C. BOTH THE COLLEGE & OLD BOYS' ASSOCIATION HAVE ADOPTED THE FOSBERY FAMILY MOTTO "NON NOBIS SOLUM" AS THEIR STANDARD. Remember to COME BACK !